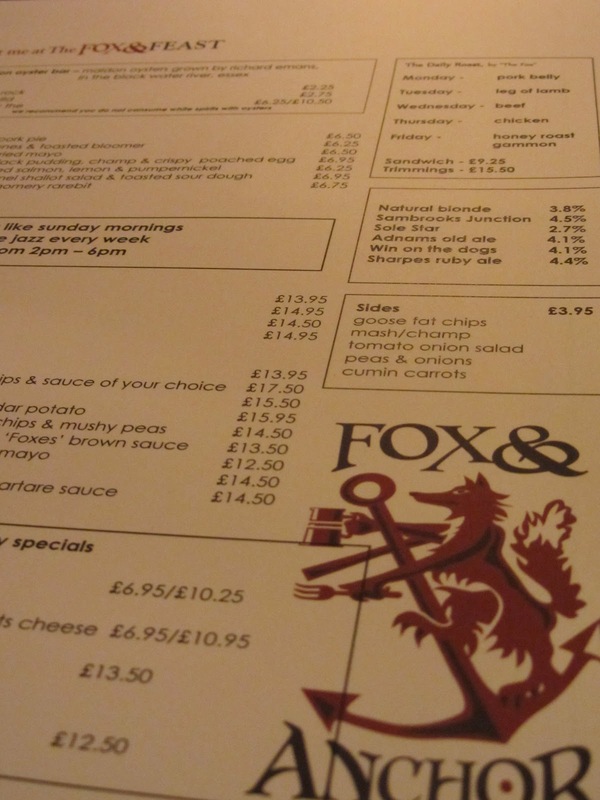 Have you been to the Fox & Anchor in Farringdon? If not, then I suggest you do. 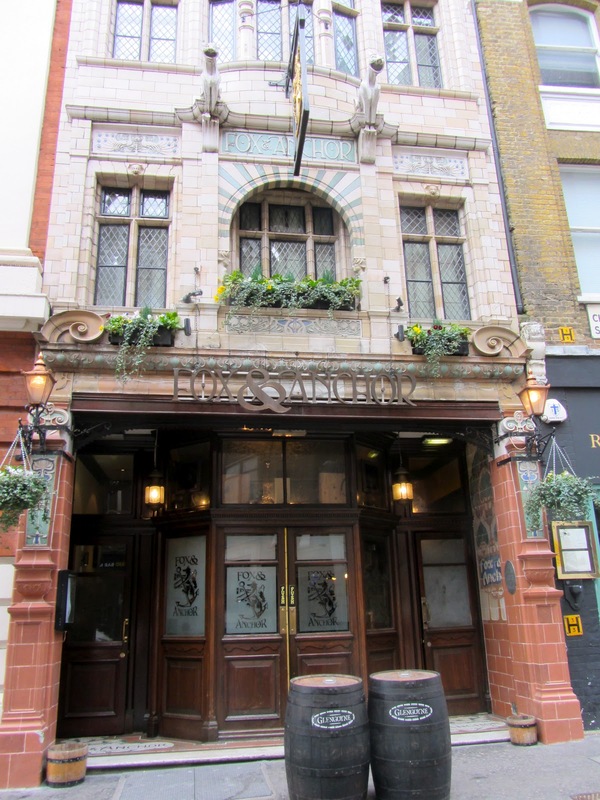 It's a proper little Victorian boozer, just a lamb chop's throw from Smithfield Market, full of character and oozing ye olde pub charm. Now, I don’t profess to know much about beer, but I do know this is a splendid watering hole for those who appreciate a range of fine ales. Especially as said ales are served in pewter tankards. And with the etched glass, mahogany and brass-clad interior, the pile of pork pies and the jars of pickled eggs, cockles and other curious pickled creatures adorning the resplendent pewter bar, it doesn’t get much more traditional than that. But aside from being a perfect pub for a pint, there are two more reasons why the Fox & Anchor is definitely worth a visit. Firstly, it has a restaurant which serves some of the most outstanding British food I’ve ever tasted (pub grub with giant bells on). And secondly, and quite unexpectedly, hidden up in the rafters lie six luxurious bedrooms. And we're not talking usual 'rooms above a pub' type accommodation, oh no, these rooms are boutique hotel status and tastefully decorated with such attention to detail, it’s a hopeless romantic’s dream bolt-hole. I enjoyed a brief encounter at the Fox last week and was hugely impressed. I arrived at dusk and the pub was already heaving with the after-work drinking crowd, so I wriggled my way to the bar to check in and a friendly face welcomed me with a smile and a key. I let myself in the door next door and ascended a few flights of stairs to the wonderful Smithfield Room on the top floor. With an eaved ceiling and diamond-leaded windows, I felt as if I’d been transported to a secluded country cottage. My favourite feature by far was the magnificent roll-top bath (complete with a gold Fox & Anchor crest), which dominated the room. When I’m lucky enough to have a grown-up house, I’m definitely going to have a bath in the bedroom. The separate bathroom was also lovely with a walk-in ‘rain’ shower and a large copper bath-shaped basin (think I’ll get one of those too), and a selection of heavenly-scented Miller Harris toiletries. As a signature touch, each room has a local scene screenprinted onto a canvas headboard. With dark hues of grey, green and wood, the decor is stylish, alluring and actually quite masculine, although I wasn't keen on the crushed black velvet cushions and window blinds which were a tad too 'nightclub' and didn't quite fit. Apart from being an ideal room to while away a few hours in a giant bubble bath, it also has all the mod-cons you need such as tea-making facilities, iron, flat screen TV and a CD player including a few CDs ranging from David Bowie to Michael Buble. And each door has a little hand-painted sign to hang up and alert others whether you're 'Nursing Hangover' or 'Gone To The Pub'. So once I managed to tear myself away from the sanctuary of my room, I ventured back down to the pub where a friend joined me for dinner. 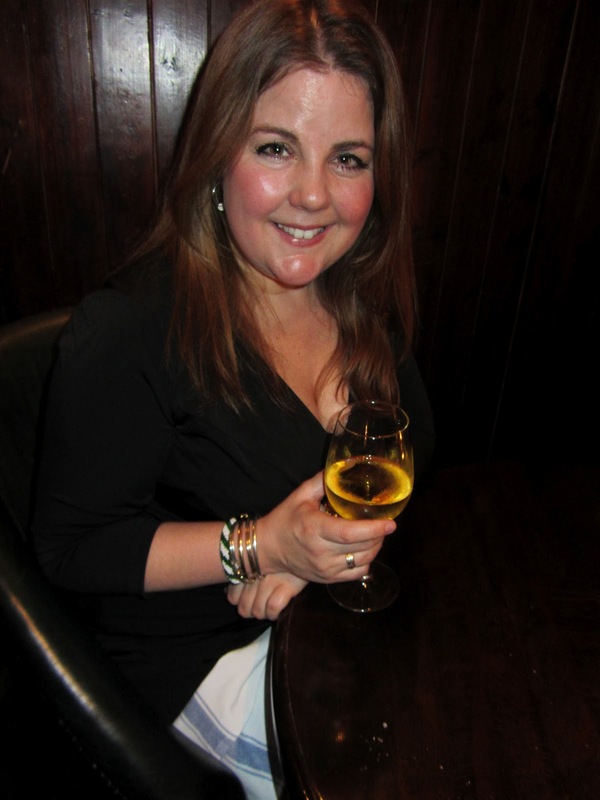 We were whisked through the bar of ale-swigging punters and led to a lovely table for two in a room known as The Snug. 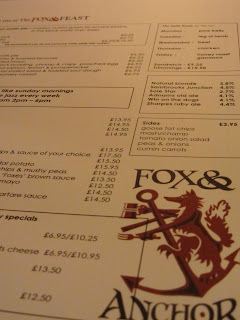 The restaurant at the Fox & Anchor has one main room with a few small wood-panelled rooms and dining hideaways off it. Cosy and candlelit, it's a perfect place for romantic dinners or intimate lunches and brunches with a bunch of friends. In fact, I reckon this would be a brilliant place to go for a long Sunday lunch. As I've already mentioned, the food at the Fox & Anchor is outstanding and it is absolutely worth coming here to dine, alone. Well not actually dine alone as in on your tod, as that would be no fun, but you know what I mean! The menu is extensive and you're spoilt for choice as literally everything sounds delicious. Using seasonal local ingredients, it really is classic, quality British food at its best. We started by ordering a bottle of the house white Cuvee Jean Paul which was a perfectly quaffable little French number. We couldn't decide on starters so went mad and ordered three! I had a Cornish Crab & Montgomery Rarebit which was so simple and tasty, I definitely think I'll try that at home. My friend had the 'Tucker Browns' Black Pudding, Champ & Crispy Poached Egg which was a meal in itself. And we shared a Scotch Egg which was done to perfection with the yolk still soft. Feeling quite full already after our starter medley, we had a small pause before the main courses arrived. I opted for fish of the day, grilled fillet of stonebass with a tomato sauce and crushed new potatoes. It was bloody lovely! Meanwhile, my friend tucked into ham hock with parsley sauce and more champ (a tasty mix of mashed potato with spring onions). 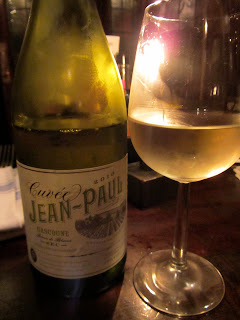 With a side order of peas, we were well and truly on our way to gastronomy heaven and both agreed the food was superb. Alas, after scoffing ourselves silly, we had no room left for pud, but did manage a cheeky glass of pudding wine before it was time to retire. As Smithfield Market operates during the night, it means the market traders are all done and dusted by the time dawn cracks. And as it's thirsty work being a trader, what better way to end a shift than enjoying an after work pint ... at 7am. The Fox & Anchor has been opening early and serving the traders of Smithfield Market for many years. But it's not only market traders who frequent this jolly inn so early in the morning, as with the City on its doorstep, the Fox is also a very popular place for city traders to come and fill up on a hearty breakfast before they go to work. And so 'The Fox's City Boy Breakfast' was born. It literally has everything you could possibly imagine including bacon, eggs, sausage, minute steak, kidneys, calves liver, mushrooms, tomato, black & white pudding, hash browns and baked beans. Oh, and a pint of stout to wash it all down. You must have one hell of an appetite to demolish that lot! I meanwhile, was still feeling rather full the following morning, but the great thing about the Fox, is that breakfast is served until 11am (and room check-out is at a very decent midday). So without having to rush, I enjoyed a late leisurely breakfast of bacon & eggs with orange juice, before thanking Scott the Landlord and his friendly team for looking after me so well. Then I bade farewell to the wonderful Fox & Anchor and worked off all that delicious food by strolling through Smithfield Market, past St Paul's Cathedral, over the Millennium Bridge, along the Southbank, through Borough Market and onto London Bridge. What a truly lovely London adventure that was. That sounds amazing - can't believe I didn't know about it, especially as I don't live far away. Will most definitely be popping in for some of that City Boys Breakfast!